Thank you. The past five years have been a transformative journey for the library and for me. As a third generation Woburnite, it has been a rewarding experience to oversee the renovation and expansion of a library so close to my heart and so present in my childhood memories- from storytime on the front lawn with Miss Becky, to getting my first library card, to studying for exams and working on group projects in the glorious Study Hall. I owe as much to this library as I do to my parents and teachers for my education. 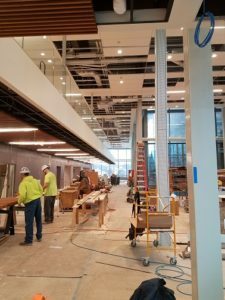 While much of this, my final post, will focus on the building project, the library’s purpose, its function over form, remains lifelong learning and supporting the goals and pursuits of the community. I am forever indebted to this library – to the staff who serve with dedication and purpose and to the resources provided – for my attainment of many goals throughout my lifetime. The careful restoration of the Richardson has been a monumental task. This building is not only celebrated on our City seal, but it is also designated as a National Historic Landmark. From the exterior masonry cleaning and window restoration to the interior wood, plaster, and paint restoration, Richardson’s original intent shows in every detail. Having recently made a pilgrimage to Paris to see the churches that served as Richardson’s inspiration for his style of architecture – Notre Dame, Sainte Chapelle, and Chartres – I saw elements that he borrowed but used in his uniquely American interpretation. From the multi-colored ribs that form the crown of the former Octagon Room’s ceiling, to the botanical motifs carved in the wood and masonry that represent the flora found in the Arnold Arboretum, to the gargoyles that once served as water spouts from the roof, his French training shines with American materials, colors, and subjects. “The present building is no doubt a good one, and by many will be regarded artistic, but with the money expended does not come up to the standard expected. In the first place it is too low, squatty, to harmonize with its character in other respects. […]There are those who ‘have literally been betrayed and sold by architects intent upon erecting monuments to their own glory.’ We believe in the beauty and attractiveness of art, but quite agree with Ruskin that ‘art is an impertinence, if it be separated from the idea of utility.’ It should be remembered that no one is exempt from committing error, and it will prove fortunate if those having charge of the Library building are aware of the mistakes already made, that others may be avoided in completing the work already begun.” signed C.
With the advantage of hindsight, our community has come to love this “squatty” stone structure that resembles a Romanesque church. I am certain that this will be true of the addition as well. I am aware that the library design has been a subject of debate in many circles throughout the community. I would like to share why I find the juxtaposition between Richardson Romanesque and the modern CBT addition to be beautiful and one that Ruskin would find pleasing. 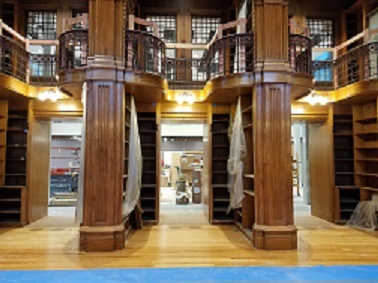 As most of the materials and skill of craftsmen Richardson employed are relics of the past, the addition serves to highlight the masterpiece of Richardson’s first library. While the glass allows natural light to stream through, creating inviting spaces, its true intent is to reflect the Richardson and provide a window to the delicate carvings and intricate design gracing the North facade. 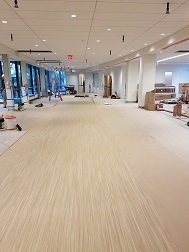 Much attention was given to carefully and discreetly connecting to the Richardson as well, and the unique system utilized surely will be one that architects come to see and study. 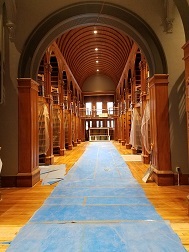 When looking down what has been called the “true cross” from the former Octagon room or the opposite end of the Frizzell Study Hall, or when seated in the Richardson Gallery, the experience is that of a grand nineteenth century building that evokes nostalgia. When walking the vertical axis of the cross, portals on the North side come into view, serving as windows into another world, into a world of contemporary thought, contemporary collaboration, and contemporary technology. The two buildings together highlight progress. We learn from our past to create our future. The library serves as a bridge. With progress comes change, but some elements remain constant. 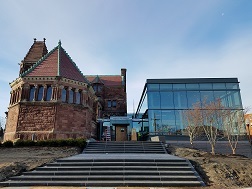 As our Interim Director, Chuck Flaherty, takes the helm for the opening of the library in March and the search for a permanent Director, our Staff will continue to serve with our mission in mind: connecting residents to resources, services and experiences that educate, enrich and entertain. The resources, services, and experiences will include modern technology, a Library of Things, and programming with depth and breadth, but their purpose remains the same. The building may be different, but there will be children and adults who meet an inspiring librarian, who find a life-changing book, who develop a valuable skill, who form a lasting friendship, who get to know their community, and who reach for the sky and touch it because of the library.